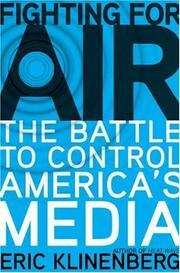 An eye-opening examination of the ever-increasing power wielded by big media conglomerates. There is a crisis going on behind the scenes of nearly every form of American media, according to Klinenberg (Heat Wave, 2003), but it’s one that average Americans aren’t likely to read about in their local newspaper, see on TV or hear about on the radio. As certain members of the FCC (supported by the Bush administration) seek to further deregulate the media industry, consumers are finding themselves with fewer sources of news, particularly important local news. Canned, prerecorded DJs dominate the airwaves; newspapers owned by mega-corporations are laying off many reporters who cover local beats (and are loathe to criticize big businesses that support them with advertising revenue); and what were once local TV broadcasts are now often farmed out to other locations, and stations are being forced to use prepackaged press videos cleverly disguised as news. Even more disturbing, notes the author, is the amount of money media lobbyists have at their disposal, money that may even be powerful enough to smother the last remaining bastion of democracy: the Internet. He hypothesizes that the day is near when service providers will be able to charge website owners a fee to provide content at high speeds—and block or considerably slow access to content on sites whose owners won’t pony up. Clear Channel and Tribune Company lead a cadre of mustache-twirling villains, while various grassroots activists and dissenting FCC commissioners Michael Copps and Jonathan Adelstein play the role of Don Quixote. There’s a sea of acronyms and interwoven relationships to navigate, but Klinenberg’s thorough reporting and cogent analysis clarify the complex ways in which media companies have become intertwined over recent years. Slightly alarmist, but necessarily so—required reading for conscientious citizens and a complement to Digital Destiny by Jeff Chester (2006).